In 1998, Ian Bremmer founded Eurasia Group, the first firm devoted exclusively to helping investors and business decision-makers understand the impact of politics on risks and opportunities in foreign markets. Ian's concept—bringing political science to the investment community and corporate decision-makers—launched an entirely new industry and positioned Eurasia Group as the world leader in political risk analysis and consulting. Over the last 20 years, Eurasia Group has developed unique services and ground-breaking tools to help clients and the broader public understand the effect of politics and political risk on their world. Today's geopolitical environment is increasingly complex, with risks coming at an accelerated pace as the world order undergoes significant change. It has never been more important for business decision-makers and investors to incorporate political risk into their strategies to spot the opportunities and manage the risks that politics creates—and to lead their organizations through turbulent times. Our services include a comprehensive suite of geopolitics solutions for clients. We offer unique and integrated products and services that combine best-in-class political risk advisory with the tools required for success in today's politically-charged global economy. Eurasia Group's dynamic partnerships with leading firms in the investment, consulting, and broader professional services space complement our politics-first capabilities and expand our suite of client solutions. Eurasia Group's advisory and consulting business is built upon a research platform of leading political risk analysts and management consultants with deep country and sector expertise. Considered among the world's foremost experts in their respective subject areas, our analysts provide tailored support to the world's top investors, executives, and strategists, helping them navigate today's volatile political climate to build future value. Global business leaders rely on Eurasia Group's geopolitical foresight for major business and market decisions that are shaping the world economy. In 2018, Eurasia Group launched egX, a platform for the new solutions required in today's dynamic marketplace. egX convenes a broad universe of resources and experts, from both within and outside of Eurasia Group, to tackle the most complex market-moving geopolitical problems. egX creates unique multi-faceted solutions that can only be developed by the firm that defined the political risk industry. Our work is built atop Eurasia Group's 20 years of intellectual capital and new economy approaches including big data and artificial intelligence technology, innovative investment solutions, geopolitical risk education, and a wide range of corporate partnerships. 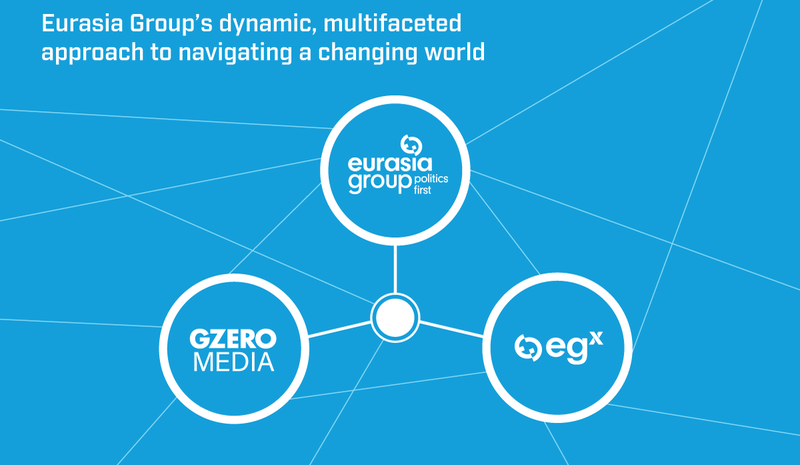 In 2017, Eurasia Group launched GZERO Media, a new kind of media company with a simple mandate: to help a broad, global audience make sense of today's increasingly volatile world. From the GZERO World show and Signal newsletter to podcasts and #puppetregime, GZERO Media brings together Ian Bremmer's irreverent and incisive perspective with a creative team of writers and artists to enlighten and entertain a global audience each day. © Eurasia Group 2019. Any copying or distribution of Eurasia Group materials is prohibited. Site by Odgis+Co and ICVM Group.